This error is related to the low-level software crashing or faulty hardware running in the Windows kernel. 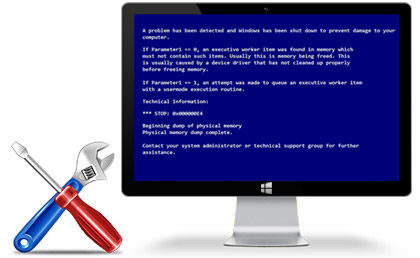 Application’s breakdown and new drivers’ installation or updating will also causes a critical error to result in a blue screen. How you get the software? The user interface is very friendly and easy to use. It differs when your computer is working or after crash and start from bootable media created using the app. 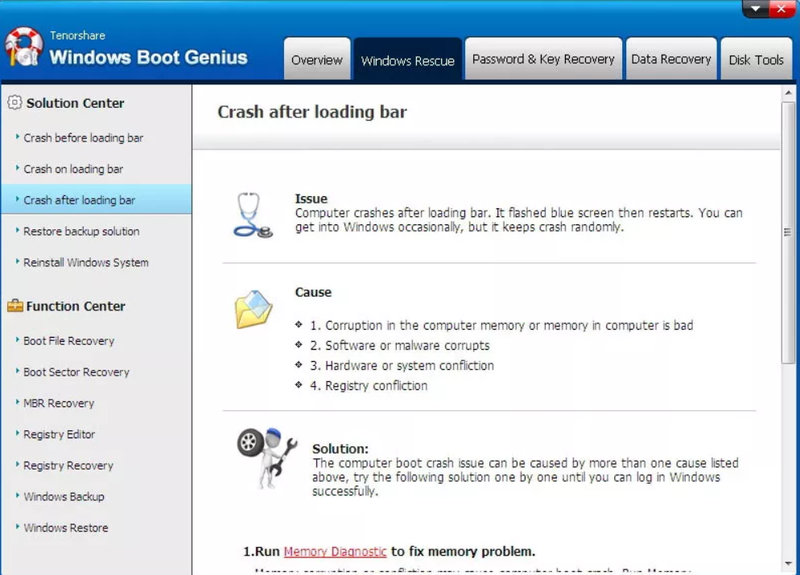 This Windows Boot software can fix all boot issues for your Windows computer. Your computer won't boot at all. Blue Screen of Death appears. Black Screen of Death flashed. Windows crashes on startup/shutdown, after sleep/startup/update. Your computer freezes after startup, or when playing games. 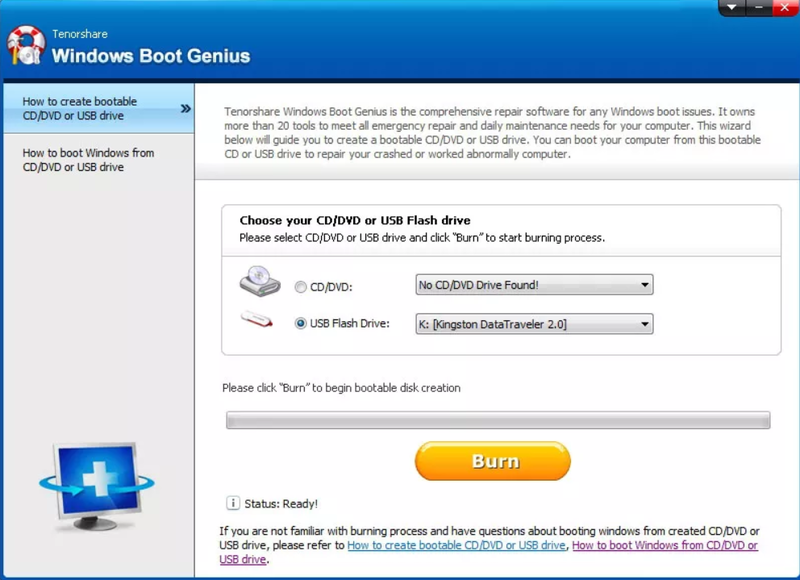 Windows Boot Genius contains disc burning software that allows you to burn ISO bootable file to a CD/DVD or USB flash drive. Then boot the computer that can't start properly with the newly created CD/DVD or USB drive to repair corrupted system under WinPE environment. Boot Sector Recovery: Recover damaged boot sector when you are encountering "NTLDR is Missing", "BOOTMGR is Missing" etc. 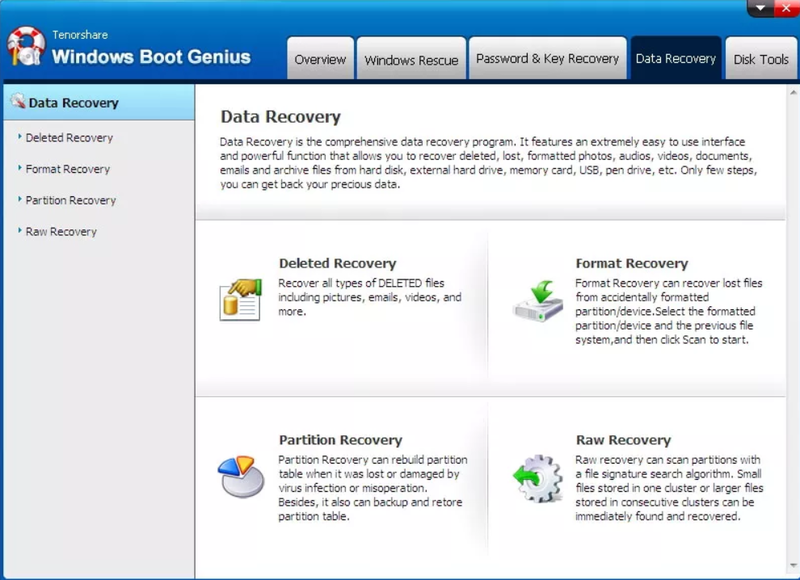 MBR Recovery: Locate Master Boot Code in system partition's boot sector correctly and add an active partition if the first hard disk on the system does not contain one. Registry Recovery: Repair registry to original state and fix registry errors. Registry Editor: Edit registry and get it work normally. You can backup your hard drive in case of data loss or before your Windows actually crash. Backup: Create a backup of your Windows operating system as well as vital data at any time in advance. Restore: Restore operating system, hard disk, partition, etc. from the backup file if you encounter data loss, system corruption cases. It is capable of recovering data from unbootable, dead hard drive. The program is highly efficient and quick. You will recover your important files in few simple steps. Deleted Recovery: Recover mistakenly deleted photos, videos, documents, etc. Formatted Recovery: Recover files from formatted hard drive. Partition Recovery: Find inaccessible partition and recover data from it. 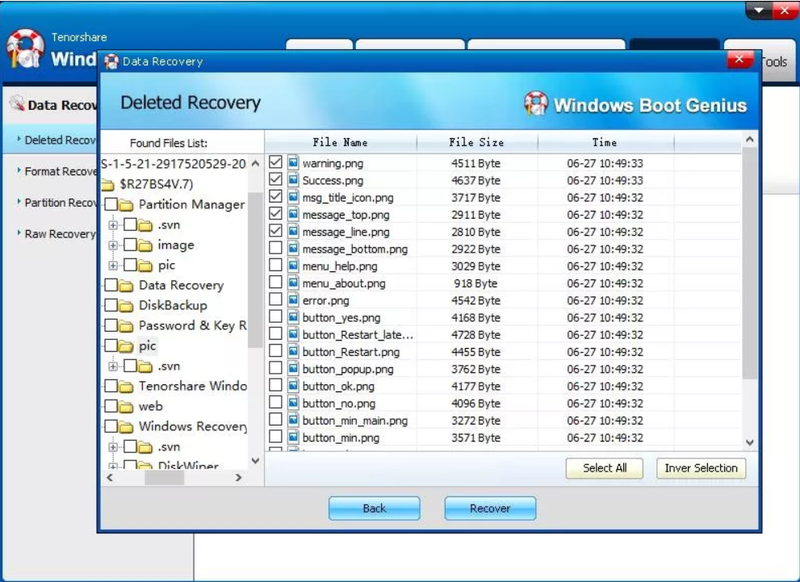 Raw Recovery: Deeply scan the hard drive to recover severely-corrupt files and folders. Can't remember Windows login password and locked out of your computer? Lost product keys after upgrading or Microsoft asks you for product key after installing Microsoft products? 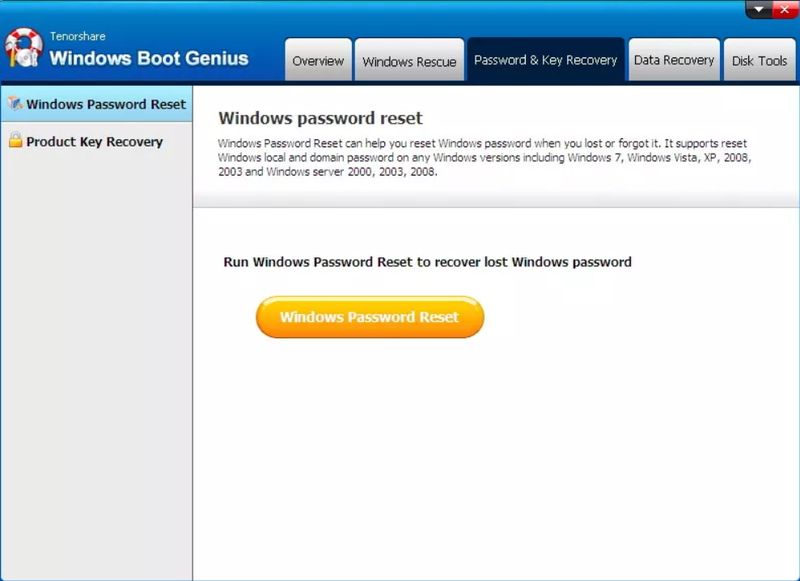 Tenorshare windows boot genius has a built-in tool that also provides you with an easy password recovery solution. 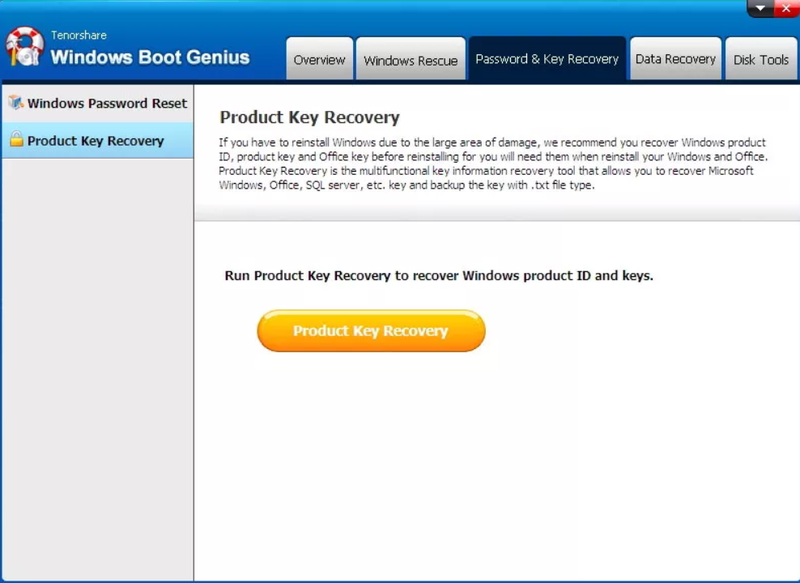 You will get back your Windows admin password as well as product keys in simple steps. Windows Password Reset: Change or remove lost or forgotten Windows local and domain password; create a new local or domain admin account to enter locked computer again. Microsoft Product Key: Retrieve Microsoft product license key and product ID. You can also save keys if you're planning to reinstall Windows. 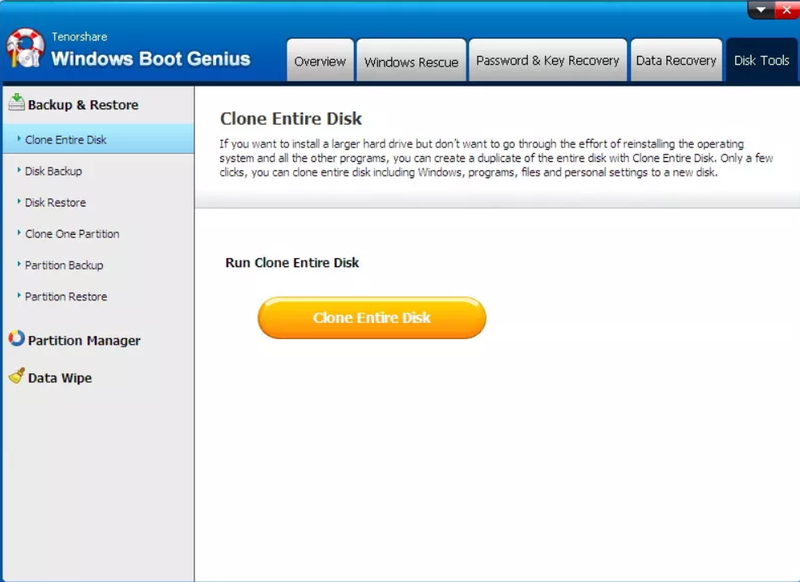 Windows Boot Genius also has a powerful data wipe function that will permanently delete any data on your computer. 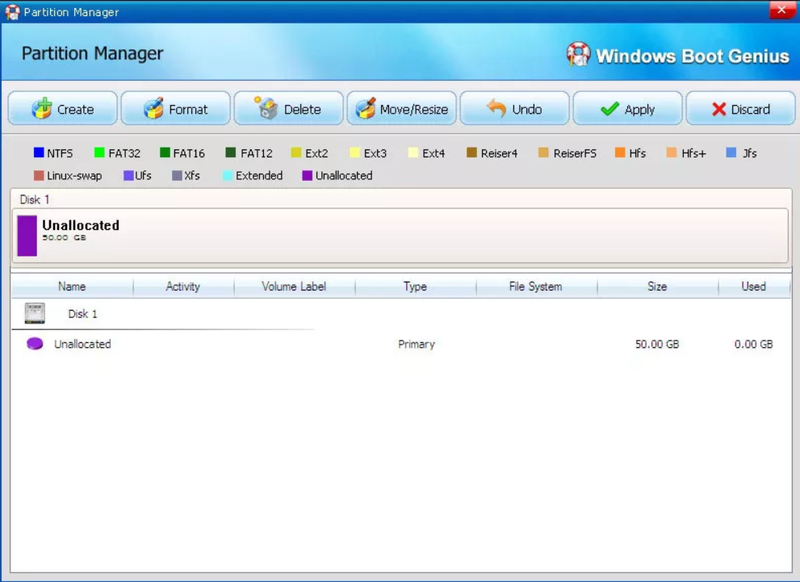 Wipe a specific partition for clean install of software or Windows. Permanently delete your sensitive folder beyond recovery. Remove virus file when your computer is infected with boot sector virus. All data wiped can't be recovered by any data recovery software. 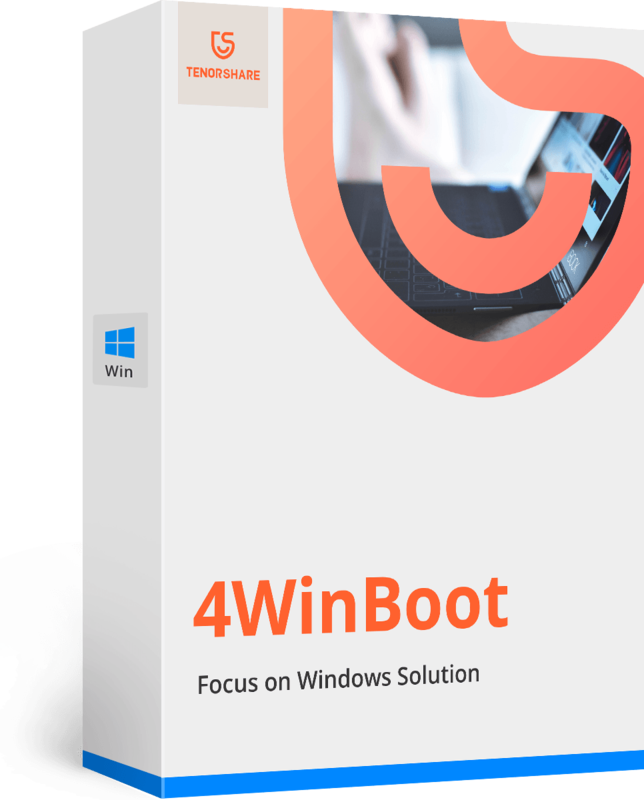 With "Data Recovery" option equipped in 4WinBoot, you can easily recover deleted documents, archives, photos, videos and other files from crashed Windows system, formatted hard drive, and corrupted or lost partition table. Run the program and insert prepared CD/DVD disk into the CD-ROM drive or connect USB flash drive into a USB port on computer. Then click "Burn" to start burning repair disk. The process is very easy. Just insert the newly burned bootable disk to the computer that won't boot then continuously press "F12" to set the computer boot from USB or CD/DVD/CD-RM device depending on what is your disk. This step may slightly differ according to your computer brands and Windows versions. Lastly, tap "Enter" and you will see an integrated page of program. This part includes two main sections; solution center and function center. The solution center shows many problems and the cause and solution for each one. 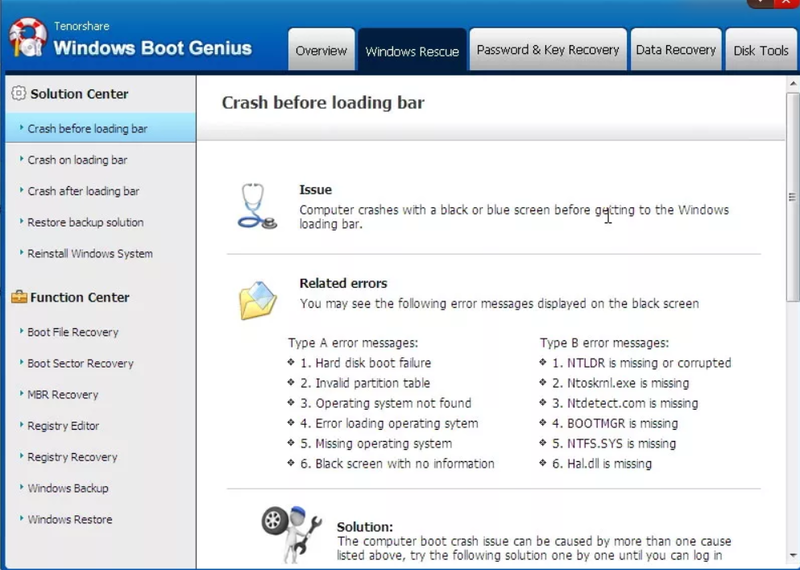 For example; crash before loading bar, crash on or after loading bar, reinstall windows, and restore backup solutions. The program has a powerful data recovery tools that allow you to recover lost, deleted or formatted files, documents, or even partitions. There are 4 data recovery available including deleted recovery, format recovery, partition recovery and raw recovery. 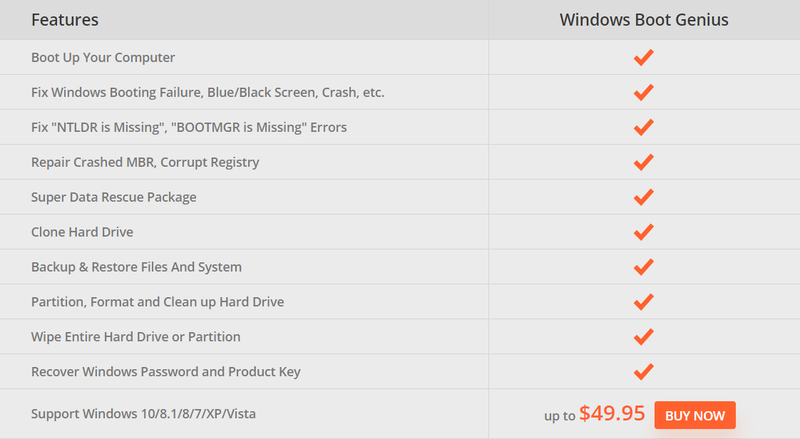 Simply choose one of them then specify the partition or folder and start recovery process. The raw recovery lets you recover small or large files in clusters. 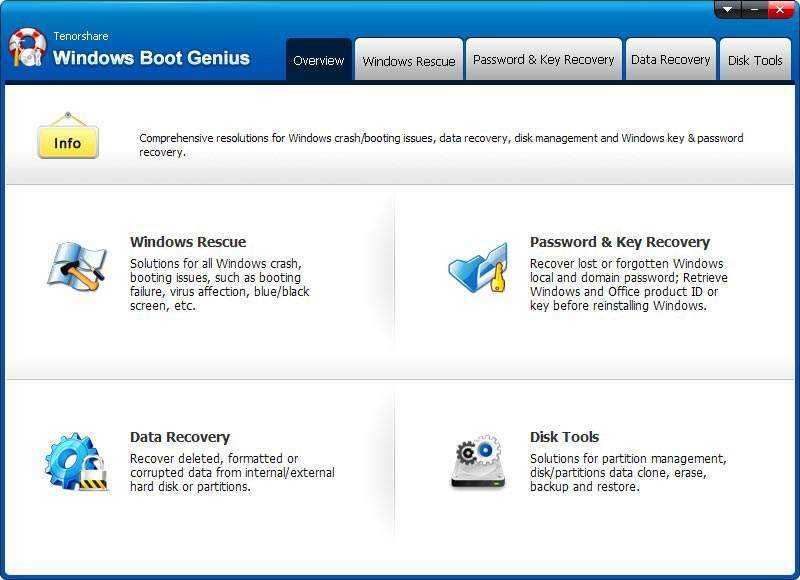 Windows Boot Genius is the All-in-one comprehensive windows repair software that includes more than 20 tools and features. You can easily boot your computer from CD/DVD/ USB and fix all PC booting problems, repair corrupt Windows system and more. Excellent review for a great product!